At the law firm of Lobb & Plewe in Corona, California, we offer a full range of legal services aimed at helping you with all of the legal needs you may have as a successful business owner, a wealthy entrepreneur or a high net worth individual. We fully understand how hard you have worked to build your company and establish your wealth, and we know what is at stake when a legal challenge threatens your company and your livelihood. We also understand that you likely wish to pass on as much as you can to your family to keep your business safe and create a lasting legacy for your loved ones. Our attorneys will sit with you and discuss your particular needs and goals so that we can devise the most effective solutions possible to help you achieve them. Whether you need general counseling or a strong advocate to fight for you in court, you can trust us to do whatever is necessary to help ensure your company is able to weather any storm now and in the future. Recognized for our impeccable professionalism and service, our law firm holds an AV-Preeminent peer review rating* from Martindale-Hubbell, so you can trust us with your most sensitive legal matters. 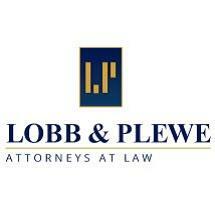 To find out more about the services we offer and how we can best serve your needs, you can contact Lobb & Plewe to schedule a consultation. I have Business owners with various needs that I always feel comfortable in referring to this Law Firm.